In the first VLOOKUP Hacks post, we talked about how the 4th argument impacts the sort order. But, there is more to uncover about this 4th argument. So, let’s pick up right where we left off. So far, we understand that the 4th argument tells Excel whether we are looking for a value between a range of values or an exact matching value. Its official name is range_lookup, and now it is time to dig into what it actually means. I have prepared a video demonstration as well as a detailed narrative below for reference. When the 4th argument is TRUE, or omitted, it tells Excel to perform a range lookup. What exactly is a range lookup? It means you are looking for a value between a range of values. The fastest way to explain this is with an example and a picture. If a salesperson had sales of 1,200 for the month, you would easily find the bonus amount of 50. If a salesperson had sales of 12,345, you would be able to determine the bonus amount is 500. When you are doing this manually, you aren’t looking for an exact matching sales amount. You are looking for a sales amount that falls between a start and end point. So, when the 4th argument is TRUE, you are telling Excel to perform a range lookup. When the 4th argument is FALSE, you are telling Excel to find an exact matching value. Note: You may see 0 used instead of FALSE in the 4th argument. Excel evaluates 0 as FALSE, and any non-zero number as TRUE. Now that we have the overall concept down, let’s dig into the Excel details. When we humans perform a range lookup, we love seeing both the start and end points. For example, in the sales bonus illustration above, there are From and To columns. Being able to see both sides of the range makes us feel warm and fuzzy. Content. Comfortable. But, here is the hack: VLOOKUP only needs the From column! Here is how I like to think about VLOOKUP. I like to think about it operating in two stages. In stage one, it looks in the first column ONLY. It starts at the top, and goes down one row at a time looking for its matching value. Once it finds it match, then it enters stage two, where it shoots to the right to retrieve the related value. So, when the 4th argument is TRUE (or omitted), it will look down the Sales column until it finds its row. Any sales amount that is >= 0 and < 1,000 will return a bonus amount of 0. And sales >= 1,000 and < 2,500 will return 50. And so on. Now that we see how this works, it is easy to understand why the data must be sorted in ascending order when the 4th argument is TRUE. In order for VLOOKUP to return an accurate result when doing a range lookup, the table must be sorted in ascending order by the lookup column. Hopefully, this helps clarify the sort order issue, which we discussed at length in the first VLOOKUP hack post. Let’s explore this capability with a few examples. 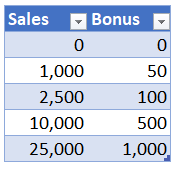 When the sales amount is 12,345, VLOOKUP returns the expected bonus amount of 500, as shown below. That is the basic operation of range lookups, but, we can apply this in many different ways. For example, we can do a lookup on date values. Then, it would be easy to have VLOOKUP retrieve the corresponding quarter label for a set of transactions. For example, we could use VLOOKUP to populate column D shown below. So, that is what it means to perform a range lookup. In the next post, we’ll talk more about the implications of the 4th argument, and how we can use it to help us perform list comparisons, aka, reconciliations! Thank you so much for this article. I use VLOOKUP all the time but haven’t been taking advantage of the range lookup capability. You’ve saved me at least two hours a month and that’s huge, especially during the month-end and quarter-end reporting rushes! A. When I use the VLOOKUP Range based formula I think of it returning the largest pre-defined range value that is less than or equal to the input value. The combination of the three columns provides a configurable slope that applies after the trigger X+Y values, instead of just assuming a flat line after the ‘steps’ initial X + Y values. All kinds of patterns can be concisely setup using that 3 column structure. It can also be translated into SQL database format for user configurable relationships. Note: I have a template spreadsheet setup that automatically graphs VLOOKUP Range type data onto an XY type graph to help users confirm the values used and highlight potential issues. I cannot attach that here, but can forward a copy on request. An early use of the three column VLOOKUP Range formula approach above, was also for Sales Incentives. For that system, the base was not the raw monthly Sales amount, but monthly Sales divided by their Target, that was then mapped to the percentage of Bonus they would be paid. Visualisation of the pattern via a graph is very useful. Even though Sales Management was warned of the open ended final segment, that pattern was to be used. Then a salesman delayed 3 months worth of monthly sales until the last month of a quarter making them eligible for ~600% of monthly bonus! Alan … thanks for taking the time to share these wonderful applications of VLOOKUP! Appreciate it! Such a simple change ‘False’ to ‘True’ yet so powerful and like Amy’s comments, such a time saver, many thanks for this little gem of information! I recently came to this Vlookup page from one of your Blog emails. As a 20+ year user of Excel, I first I thought “OK, so here are some entry-level Excel techniques – maybe not much of interest…” but I have to say, your basic walk-through of how Vlookup functions with the “True” argument made me think about Vlookup in a way I hadn’t before. I mostly have used that function to “match” items between tables and to retrieve a specific data element. I had always considered the “True” option to be a handicap, since you could receive a potentially false “match” if your query value wasn’t in the searched table and it would force you to sort your data first. I really hadn’t thought about the utility of using the “True” Vlookup qualifier to select a value (eg. Bonus value) based on a “threshold” (i.e the first value that would meet the criteria – eg. 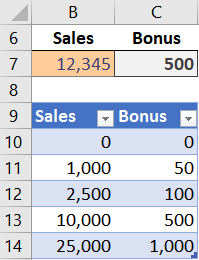 a given sales level), given that Vlookup would trigger on that first value, but rather would likely have written a formula that looked for a value “between” a set of numbers. Often simple is better. Thanks for providing these examples.